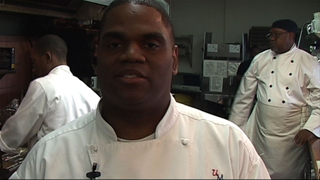 Cafe 458 Executive Chef Tony Sharpe has made us proud yet again! Working alongside Chef Clarence Ridgley and a team from Le Cordon Bleu College of Culinary Arts, Chef Tony helped score a major victory at Culinary Fight Night. In this unique event, Atlanta’s top chefs compete inside a boxing ring. 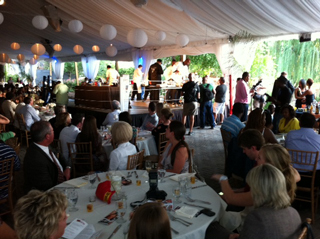 Ringside judges score their culinary concoctions on taste, presentation and creativity. Each team picks a favorite charity to highlight. Chef Tony’s team selected Atlanta Center for Self Sufficiency in hopes of building awareness and financial support for an organization that helps break the cycle of homelessness. Thank you! And nice work, all. 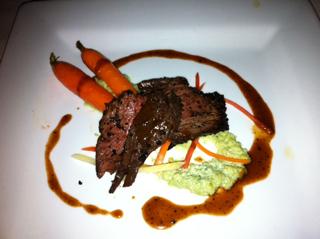 Main Course: Peppercorn seared beef tenderloin with sauteed Brussels sprouts and baby carrots. Even if you missed Tuesday’s competition, you can still enjoy Chef Tony’s work every Sunday at Cafe 458. Proceeds from our public Sunday Brunch (including tips) support ACSS programs during the week to empower homeless individuals to become self sufficient, productive and charitable members of our community. 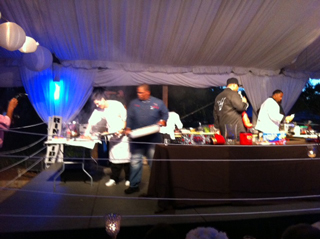 Culinary Fight Night pits Atlanta's top chefs in a head to head cooking competition inside a boxing ring! 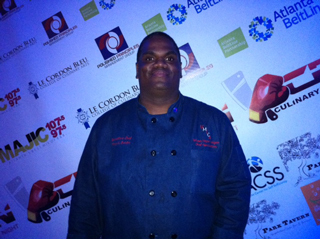 Chef Tony Sharpe at Culinary Fight Night. 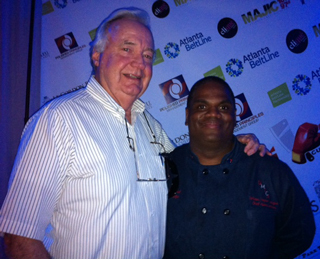 ACSS Board President Tom Body congratulates Chef Tony Sharpe. 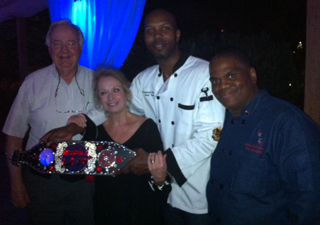 Cafe 458’s own Chef Tony Sharpe will compete in Culinary Fight Night., 6 p.m. August 23 at the Park Tavern. The unique, boxing-themed event not only highlights Atlanta’s top chefs, but also delivers a charitable punch. Chef Tony and his team will be representing Atlanta Center for Self Sufficiency as they compete with another culinary team representing Atlanta Beltline — two great causes that improve the quality of life for people in Atlanta and beyond. The chefs will cook head to head, preparing a three course meal inside a boxing ring, while ringside judges and members of the audience score the food in three categories: taste, presentation and creativity. Atlanta Center for Self Sufficiency is a results-driven, non-profit organization committed to breaking the cycle of homelessness through intense job readiness and life skills training. Cafe 458 is an award-winning restaurant that provides balanced meals to homeless clients during the week as they attend programs managed by Atlanta Center for Self Sufficiency. On Sunday, the cafe opens to the general public for brunch, with all proceeds (including tips) going back to ACSS programs. 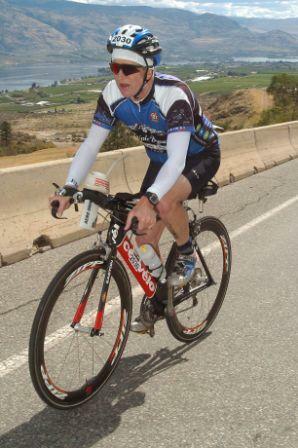 ACSS Board Member and passionate triathlete Bishop Leatherbury has accepted the challenge to raise $100,000 for ACSS by competing in the Annual Ironman World Championship to be held in Kailua-Kona, Hawaii on October 8, 2011. It’s a race that combines a 2.4 mile swim, a 112 mile bike ride and a marathon, all of which must be completed in less than 17 hours! As Southeast regional managing partner of Tatum, LLC, Bishop has helped many Atlanta leaders to assess challenges, pursue opportunities and mobilize the right resources to solve problems and achieve results. As a valued member of the ACSS board, Bishop has utilized these same skills to help homeless men and women rebuild their lives. ACSS continues to demonstrate its worth through the year-to-date performance of its programs. ACSS CareerWorks has graduated 210 (93%) of the homeless clients called Visionary Innovative Partners (VIPs) from the program with 155 VIPs obtaining full-time employment earning an average wage of $9.25 per hour. Cafe 458 has had 67 VIPs enroll in the Cafe program since January 2011 with 36 new enrollees during the 2nd quarter. Ten of those VIPs obtained permanent housing, and 30 entered shelters or transitional housing. Twenty-two of the VIPs obtained benefits. Seventy four military veterans (50 males and 24 females) enrolled in ACSS Veterans Reintegration Programs resulting in an additional 31 full-time jobs this year. Bishop’s efforts to complete the race and raise money for ACSS provide the benefit for all of us to potentially see fewer people on the street without a place to call home. Please get involved today by making a donation and helping Bishop reach his goal of $100,000. Donors who support the ACSS cause will be provided a tax receipt and the great personal satisfaction of helping the less fortunate to transition back into the workforce and becoming a vital human resource for the community. Young men in boxers promote the National Suit Drive. This morning, thousands of rush hour commuters were exposed to an unusual sight. The reason for this eye catching stunt was to promote the Men’s Wearhouse National Suit Drive. Throughout August, Men’s Wearhouse stores throughout the U.S. will accept donations of gently used professional attire to help men seeking employment make a good first impression at job interviews. Atlanta Center for Self Sufficiency is one of the beneficiaries of the program. It’s one reason ACSS graduates are not only among Atlanta’s most qualified job applicants, but also the best dressed! The National Suit Drive runs through August 31, 2011. For every suit collected, Men’s Wearhouse will donate a tie to the cause. The company is also donating $1 for every new “like” it receives this month (up to 10 thousand) on its Facebook site. Click here for more details on the National Suit Drive.